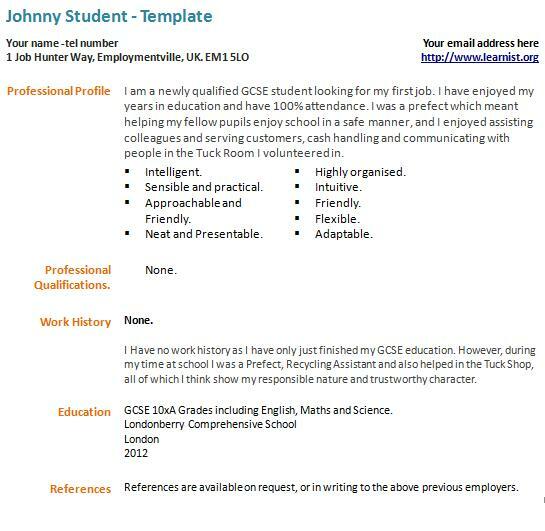 Use this CV example if you are going to make your first CV as a template. Time for your first CV? Writing your first CV can be daunting if you have no jobs to put on it! But, all you need to do is show your employer what skills and experience you have, along with the kind of person you are, and this should be sufficient along with a good covering letter. I have created a template to illustrate this. I am a newly qualified GCSE student looking for my first job. I have enjoyed my years in education and have 100% attendance. I was a prefect which meant helping my fellow pupils enjoy school in a safe manner, and I enjoyed assisting colleagues and serving customers, cash handling and communicating with people in the Tuck Room I volunteered in. Intelligent. Sensible and practical. Approachable and Friendly. Neat and Presentable. Highly organised. Intuitive. Friendly. Flexible. Adaptable. Professional Qualifications. None. I Have no work history as I have only just finished my GCSE education. However, during my time at school I was a Prefect, Recycling Assistant and also helped in the Tuck Shop, all of which I think show my responsible nature and trustworthy character.